Vybz Kartel famously gained on a ton of weight during his high profile trial in 2014. At the time, sources say that his weight gain was as a result of stress from the trial and subsequent conviction. He was sentenced to life in prison and it seems he has been spending his time well. We’re told that football is almost a daily ritual for Vybz Kartel and other inmates. “It’s one of his ways of keeping fit and of course there are other exercises,” sources told us. Our Gaza source who regularly visit Kartel in prison told us that he also plays domino and ludo with fellow inmates which are two of his favorite pass times. Clearly, Vybz Kartel is not just making hits in prison, he is also staying fit and appears to be in great spirit ahead of his upcoming appeal trial in July of this year. The “Fever” deejay, as well as, other inmates at the Tower Street Adult Correctional Center prison visits were recently suspended indefinitely after authorities uncovered two massive tunnels on the prison grounds. Authorities believe that inmates have been digging the tunnels in secret as part of a master plan to escape prison. A full investigation is currently underway. 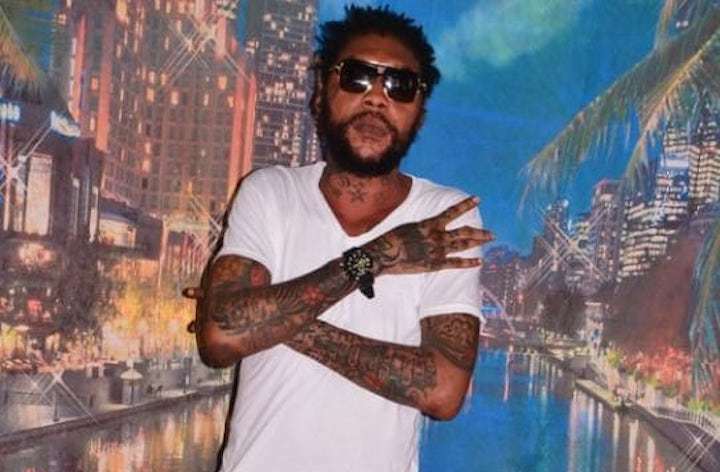 Aside from keeping fit in prison, Vybz Kartel continues to flood dancehall airwaves with a ton of new music making him one of the most relevant deejays in the business currently. He is currently working on a major project set for release later this year. Watch the video below showing Kartel playing football at GP. It looks like Di Worl’ Boss has been sitting on some heat for a few years. The wait is over for dancehall fans who have been anxious for Vybz Kartel to release “Real Bad Gal” after hearing a sample from a mystery track on PartyNextDoor’s “Not Nice” back in 2016. On Party’s P3, he borrows from a collaboration of Dre Skull and Kartel, revving up the dancehall singer’s patois, transforming it into the song’s background noise. Two years later, Kartel still has a firm grasp of his signature sound: rapid fire flows bathed in salacious lyrics. “Real Bad Gal” manages to sound like it belongs in 2018 and feels like the fix his cult following needed—an ode to the “bad gal,” the archetype often idolized in West Indian culture for outspoken women. Dre Skull, famous for his work producing songs with other reggae stars like Popcaan and Beenie Man, hinted on Twitter that the song would be released in 2017, and although that didn’t happen, “Not Nice” went on to go Gold. But what makes Kartel a phenomenon isn’t just his ability to make hit records, but his ability to do so while incarcerated. 2018 was shaping up to be a big year for him, with an appeal in July scheduled for his 2014 murder conviction. According to Nationwide Radio, a Jamaican news outlet, the appeal has been pushed back to this July, but will Vybz release more music in the meantime? Kartel is facing a life sentence behind bars, a circumstance that would rattle a number of people but seems to only fuel his appeal. A 2011 arrest for possession of marijuana led to the indictment of two murder cases in the deaths of Barrington Burton and Clive Williams, resulting in a minimum of 35 years in prison. While behind bars, Vybz has managed to maintain his position as the voice of Portmore, one of Jamaica’s disenfranchised cities. Streaming sites are bloated with releases from a man who should have no access to recording equipment, but Kartel says the multiple LPs released since his incarceration are just the result of a hard work ethic. “I've always been a prolific songwriter, and I record at breakneck speed as well, so I have a lot of surplus material to choose from," he says in a 2016 interview with Rolling Stone. "There is a recording studio at another correctional facility [in Jamaica] but none here… cellphones, laptops, or any Internet-capable instrument are prohibited items.” But how is he doing it, is the question no one seems to have an answer to. Shortly after his interview with Rolling Stone, he was sent to a Tower Street Adult Correctional Facility, a maximum-security prison, to ease any rumors that he’d been recording while incarcerated. It wouldn’t be inaccurate to liken the spirit Vybz conjures in Jamaica to the one summoned by Gucci Mane in Atlanta during Gucci’s time behind bars. Incarcerated at the height of his career, Kartel’s presence is present in the flows circulating around the riddims of his predecessors.